A successful exit is often the unstated dream for most tech founders and the investors who back their businesses. The exit usually comes in the form of a bigger company acquiring the startup usually for its product or its engineering team. 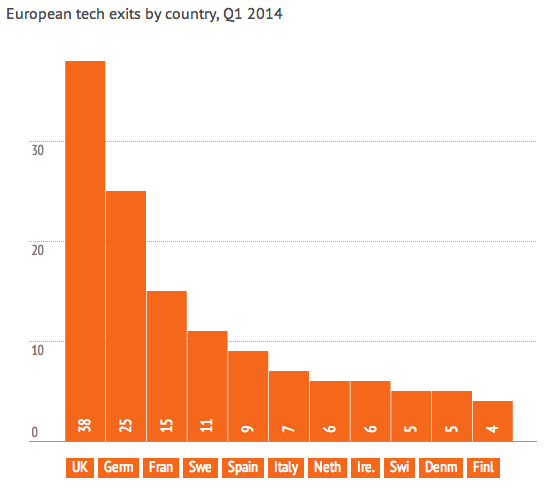 Figures for Q1 2014 show that UK tech businesses were the most prolific in selling out across Europe. These figures interestingly reflect the relative maturity of the tech ecosystems across Europe and perhaps where acquirers prefer to base their R&D teams. As a side note, London secured 42% of the exits in the UK. Clearly, London is a good place to base a tech business. Mobile learning is addictive and zzish! I’ve been working with the Zzish team who are going through Techstars in London. Techstars is a highly regarded accelerator programme that’s created many successful technology businesses. I’m finding that being part of Techstars is a really valuable learning experience. I’m surrounded by energetic entrepreneurial teams who have come from all over the world. Through my work with Zzish, I’m also learning a lot about the mobile education space. I don’t think mobile education gets the same coverage in the tech press like other areas in mobile such as payments, commerce and navigation. So I’m pleasantly surprised with what I’m discovering. For a start, the mobile education industry is expected to undergo a lot of growth globally. Not only in the US and Europe but also in Asia, Latin America and Africa. Much of this growth will be driven by both the increasing use of smartphones and tablets and parents desires to find more effective ways to improve learning for their kids. Based on current predictions, the biggest change we’ll experience will be the growth in e-books and e-courses. I love reading paper-based books. However, it seems that the next generation of school kids and university students won’t be turning as many paper pages. Increasingly publishers will digitise more education content and adapt it so it can be read on mobile devices. The other big change that we’ll see especially in North America and Europe will be the use of game and simulation tools in education. Educational content will be mixed with concepts such as augmented and virtual realities to create engaging, competitive and social environments where learning something new becomes fun, interactive and accessible from anywhere. If learning becomes stimulating and even addictive, I wonder what implications this has for the world we’ll be living in in 2020. I hope to write more on mobile education and what Zzish is doing in another blog post. It’s great working with Charles, Samir, Ed, Buket and others at Warner Yard. By the way, Zzish are looking for a web developer. Email Ed if you know someone who’s interested.